Skelton Truck Lines has individual validations performed on each and every trailer by an independent engineering company and is the only company of its kind to do so. All Skelton trailers are validated for 15°C to 25°C, 2°C to 8°C and less than -20°C. To further enhance our preventative safety measures, we have implemented a double reefer system on many of our trailers. 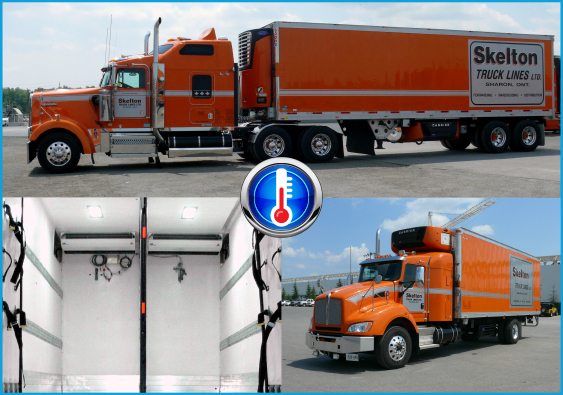 A minimum of three state-of-the-art temperature probes provide accurate monitoring for both the product and air temperature within the trailer. All trailers are monitored by an Electronic Temperature Recording System. This system utilizes the probes to record temperature data every 10 minutes throughout the trip. Moreover, an active temperature alarm system is engaged at all times as soon as the loading process is started. As a final safeguard, our drivers are provided with an in-cabin display to keep temperature visible at all times. All of Skelton’s trailers are furnished with over-spec’d insulation, which is included in the floor and the ceiling. An insulated bulk-head is installed in each trailer to reduce temperature fluctuation during docking procedures.